City planners and residents in a New Orleans neighborhood are looking to two microgrid projects as a means of enhancing emergency services and improving water infrastructure and resource management. Part and parcel of developing the Gentilly Resiliency District, the two planned microgrids are to provide emergency back-up power in the event of disasters, as well as power water pumps and produce electricity for Dillard University and the University of New Orleans, Greg LaRose reports for The Times-Picayune. In addition to providing electricity for the Dillard U. campus, one microgrid is also to provide electricity to a nearby water pumping station, gas station, pharmacy, bank, library branch and post office. The University of New Orelans microgrid is to power canal pumps as well as the campus, which is envisioned as serving as an emergency shelter that offers food, health and pharmacy services among others, according to the news report. 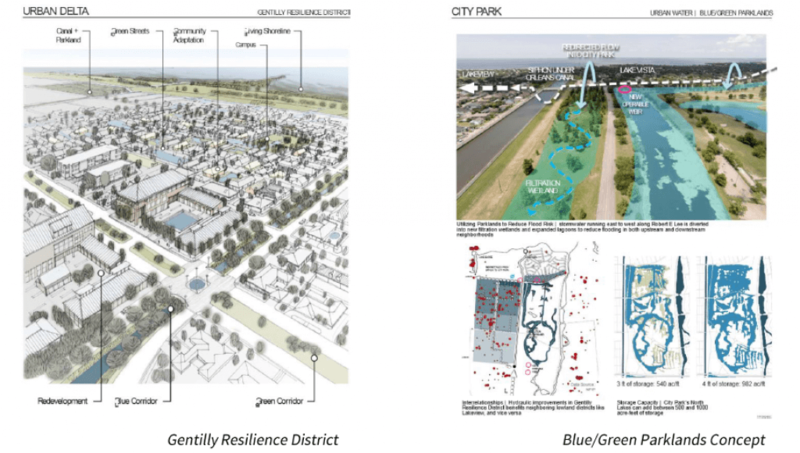 The U.S. Department of Housing and Urban Development (HUD) awarded New Orleans a $141 million grant to help fund development of the Gentilly Resiliency District. The grant was one of 13, a total of nearly $1 billion, of grants awarded to the winners of the National Disaster Resilience Competition (NRDC), which has been carried out in partnership with the Rockefeller Foundation. NRDC grants are to be used to build out housing and infrastructure projects that enhance reslience to extreme weather events, other disasters and the effects of a warming climate.”Climate change is real and we must think more seriously about how to plan for it,” HUD Secretary Julián Castro was quoted in a press release. Forty states and communities that had been hit by disasters between 2011 and 2013 were invited by HUD Secretary Castro to participate in NRDC. New Orleans officials requested $7.66 million from HUD in its NRDC Gentilly Resiliency District project proposal to build out one microgrid and will contribute $4 million in local funds to the project. City officials are in talks with HUD to find out exactly how much money the agency will approve for specific projects, LaRose adds. They’re looking to other sources, such as community development block grants and/or Federal Emergency Management Agency infrastructure funds, to make up any shortfall.